This podcast describes the 8 Steps to Automate Your Marketing & Scale Your Practice Up, reminding you that “It’s not your job to personally handle every part of the business”. We talk about booking applications such as Hit Appoint, Set More, Cliniko and Schedule Once as ways to automate marketing and save you time. Review sites where your practice might be reviewed: Google, Facebook, Realself, Rate MDs, True Local or Yelp. 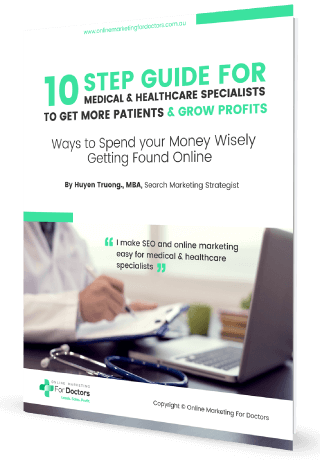 Huyen – Welcome to another episode of Online Marketing for Doctors podcast . 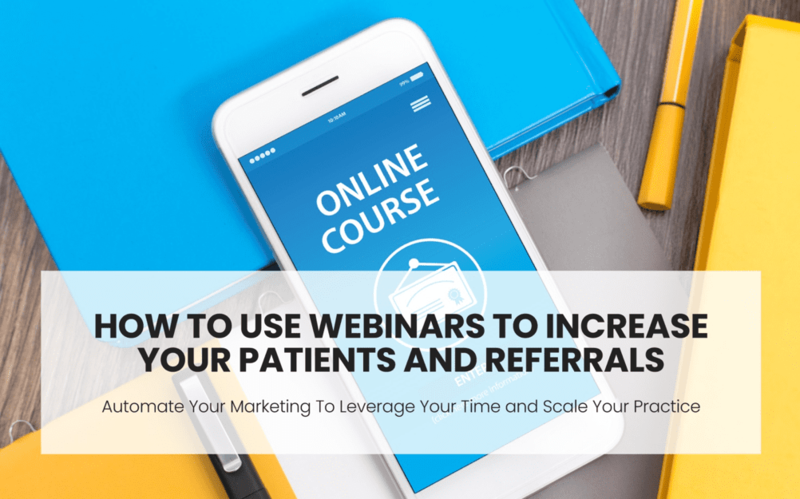 Today we’re talking about 12 Truly Awesome Ways to Reduce No-Shows from patients. 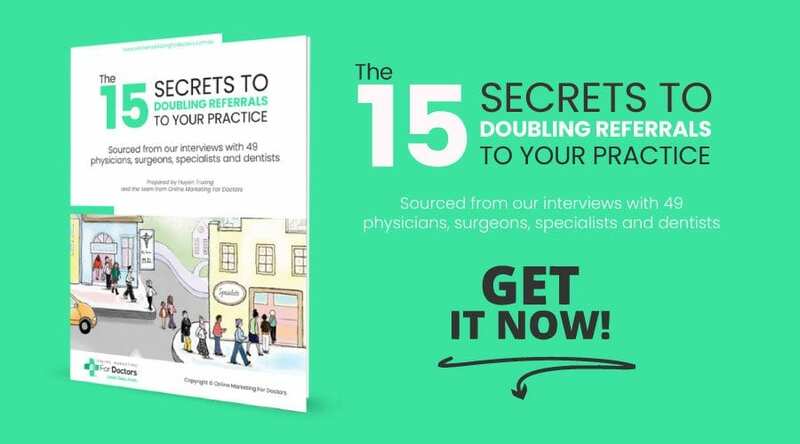 Ahh..This is a hot topic for all healthcare practitioners, especially those with busy practices: patient no-shows are a massive cost for the healthcare system, and can impact your practice. Just the other day I was talking to a physician about the bad week he’d had: numerous patient cancellations and No Shows had really thrown his schedule out of whack. After hearing that, we decided to create a podcast about this topic because we believe it will be very helpful for many of you. Steve – Yes, this is so very important… Patient no shows and last-minute cancellations come with a big price tag for busy practices. They’re also a huge source of frustration. From wasted preparation time to lost revenue, a no-show can really throw off the flow of your practice. Huyen – As you can see, there’s a lot riding on the question of how to reduce patient no shows and the miscommunication surrounding them. But how do we do that? I think the first step is to track your no-shows. Analyse three to six months’ worth of data to identify those patients who miss the most appointments. Ask these patients why they missed their appointment. Document their reasons, to give you a better understanding of why no-shows occur. At the same time, figure out which physicians, appointment slots and times of year consistently demonstrate the highest no-show rates. Unavoidable emergencies, which may affect one or two patients daily. Sorry folks, there is nothing you can do about Katie’s dog getting loose, or John’s child missing the bus. Patients not feeling a connection to their doctor or other staff. Our data shows that new patients, patients who see several different physicians in the same office, or those who don’t know their doctor very well, are less likely to keep appointments than patients who have an established relationship with their physician. Huyen – That’s quite a list, Steve! As we can see, not every no-show can be eliminated. But there are very effective ways to reduce their frequency. Consider providing a quick and courteous reminder to patients about their upcoming appointment. This not only serves to jog their memory, but is also a thoughtful step that improves patient loyalty. Many patients rely on these convenient reminders and automating this process can save your practice hours every week, especially if you’re using a manual system. Since we’re all about helping you grow and scale your practice, I highly recommend a good booking application as one of the fundamental steps towards business automation. This is crucial for practice building! If you haven’t got a booking application, please get one. If you already have one, ask your provider about the application’s various features, and make sure it has an automated reminder feature via both email and SMS. Provide an incentive for patients to show up by allowing them to prepay for their appointment. Patients who know that they’ve already committed money to an appointment have a far greater incentive to show up than those who don’t. You can even offer a discount to patients who prepay for their next visit. Instead of handing patients their follow-up date and time on an appointment card, trying giving them a blank card. Having patients fill in the date and time of their next appointment, causes no show rates to drop 18%! By writing down their booking details, patients actively commit to that appointment, and it’ll remain a priority for them. Huyen – Wow Steve, those first three methods are very interesting! Here are some other great ways to reduce no-shows that will fit in nicely with the methods Steve mentioned. Call your patients the day before their appointments. During the last 20 to 30 minutes of the practice day, have your staff call each patient scheduled for the following day and remind them about their appointment. Many booking applications can automate this through SMS text message or email. This is a great tool, but I’d recommend only using this automation as a supplement to a real live human calling. In other words, have your staff call the patient and speak to them! You can then mention they’ll also receive an automated e-mail or text confirmation. Steve – Another way is to encourage your patients to tell you if they can’t make it! Ask them to call 24 hours in advance to cancel or reschedule. Notice I said encourage — don’t threaten them with no show fees. Next, think carefully about how you handle late arrivals. This is one of the MOST common things we see when our team is brought in to figure out what’s causing no-shows in the practice. Often, staff eager for their break turn away a patient who shows up 15 minutes late instead of looking for other options. Luckily, this is easy to fix! Implement a practice policy that patients who arrive late are never to be turned away: instead, check with the doctor to see if they can be squeezed in or rescheduled for after lunch. This also illuminates the importance of not closing for lunch. A staggered schedule helps eliminate this problem, but if you must close for lunch, don’t lock the door! Huyen – I agree. It’s challenging for patients to take a break from work—they either have to take the morning off, or try to squeeze in an appointment in their breaks. Sometimes, patients don’t mean to no-show. They simply forget an appointment, or they double book themselves. This is another chance to use your booking application to send an automated message: let them know you’re sorry to have missed them, and encourage them to reschedule. You can also remind them of your missed appointment policy. When patients schedule appointments, ask them for their preferred contact method. Do they have a home phone? A mobile? Do they want a phone call or a text message? Or would they prefer an email reminder? Having both a preferred, and an alternate contact method makes it easy to prevent them from becoming a no-show. Your patients are busy! Asking them to wait 20 to 40 minutes or more for an appointment increases the likelihood they’ll opt out of future appointments. If patients don’t feel you value their time, they are less likely to value yours. This is how a no-show turns into a lost patient. How about showing appreciation for the patients who do show? Huyen – Yes, why not! Steve – Acknowledging patients for doing the right thing is guaranteed to keep them showing up for scheduled appointments and arriving on time. It helps build patient loyalty by showing patients that their time and cooperation are appreciated. Patients who keep their appointments and arrive on time, can be rewarded with a small discount on their bill. The names of on-time arrivals might also go into a drawing for a gift card each month. No shows are an unfortunate reality — emergencies happen! However, to ensure the patient experience remains a positive one, it’s important to show appreciation for the “do shows”. Thanking patients for being punctual and encouraging receptionists to be the smiling, welcoming face of your practice goes a long way. Huyen – Here’s another interesting one – Collect patient information earlier in the process. Have patients fill out important information and provide medical documents ahead of their appointment: patients who spend time providing information upfront are less likely to miss their appointment. It will also better equip your practice to care for that patient, and encourage new patients to pick you over other practitioners. Cloud-based electronic health record (EHR) systems allow patients to directly upload their documents for the practice to view, and can greatly increase practice efficiency — which will help appointments run smoothly. Steve –Establishing relationship with patients is crucial. Patients who don’t feel an established relationship with their doctor are more likely to miss their appointments than those who feel a close connection to their physician. This includes new patients, those who see numerous doctors in the same practice, and those who don’t feel they know their doctor very well. Developing a rapport with these patients can help reduce no-shows. A better relationship also helps you educate patients about why a certain test or follow-up visit is important, and improve patient coopération. You have year-round opportunities to cement the relationship you have with your patients. Send birthday and holiday wishes, and use your website or regular newsletter to offer them ongoing information. A patient newsletter keeps patients abreast of events in your office and offers handy healthcare tips for their immediate use. All of this helps make your patients feel valued: when this happens and patients feel that you’re personally interested, they’re considerably less likely to become a no-show. Huyen – Yes, building relationships through regular communication via website content and newsletter is very important, and we’ll dive in this topic in a whole new episode in up coming weeks. For now, here’s our final tip! Make appointment policies clear and accessible. Emergencies and other mishaps happen, and late arrivals are a reality. Many no shows result from patients running late and choosing not to show up because they think they’ll be turned away. Clarify your late arrivals policy, along with recommendations on booking and cancelling appointments, to ensure clear communication. Make this information easily accessible for your patients on brochures and on your website. Well, that is for today’s epic episode about 12 Truly Awesome Ways to Reduce No Shows. Thank you so much for tuning in, as always, I’d love to hear from you: what are your other awesome ways to reduce no show rate? Our medical practitioner community would love to hear your stories! Leave your comments below and be sure to subscribe to our podcast on Itunes, Stitcher or any other podcast app. Become an OMD Insider and you’ll receive instant access to our training, podcasts, videos, and ebook library with valuable information to help you make the most of your time and energy to grow your practice! I hope you enjoyed this episode, we’ll see you next time! Huyen, I’ve included this because you’ve used it as the tag in all your other scripts, and thus it seems worthwhile to continue including it. Happy to omit if you would prefer. Huyen, I didn’t want to delete this because of the embedded link, so I’ve left it in, but the rephrased text above covers it. Again, I didn’t want to delete this because of the embedded link, but I’ve rewritten it as follows. Earlier, you said not to penalise no-shows in any way, so I’d strongly consider removing this option, or changing the earlier text, because this is contradicting itself.